BloodNet 5 was released on Sunday, 1 July 2018. Thank you to all BloodNet users for your assistance in the transition to the new version of BloodNet. The NBA has received a lot of feedback and appreciates all the suggestions. These will be reviewed for possible inclusion in future updates to the system. The ‘Print from PDF’ button has been added to the ‘Templates’ page. When creating a Special order with multiple rows for the same patient, when the patient details are changed on one row the system will now prompt the user to apply the changes to all the rows. On the ‘Special order search’ screen the results are now sorted in descending order of the sent date. When an order is sent or cancelled a notification will be sent to all the email addresses listed on the facility’s distribution list. When a Dispense request is expanded on the Authorisation Dashboard, the Authorisation number is now hyperlinked. On the ‘Return to stock’ screen the date/time will default to the current date/time. On the ‘New dispense episode’ page, users can now dispense multiple vials of the same product by scanning the same barcode more than once. Facility Administrators can now remove a discard episode by removing all items and the saving the episode. On the ‘Edit discard episode’ screen the name of the user who created the episode will be displayed. On the 'New transfer episode' screen the facilities in the 'Transfer To' and 'Transfer From' drop down fields are displayed in ascending alphabetical order. 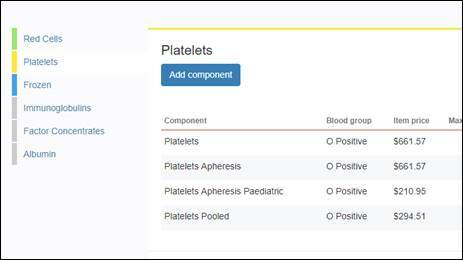 A new generic platelet code has been included in BloodNet 5. The generic platelet option should be used where facilities do not mind whether they are issued apheresis or a pooled platelet by the Blood Service that match the ABO, Rh(D) and modifiers. 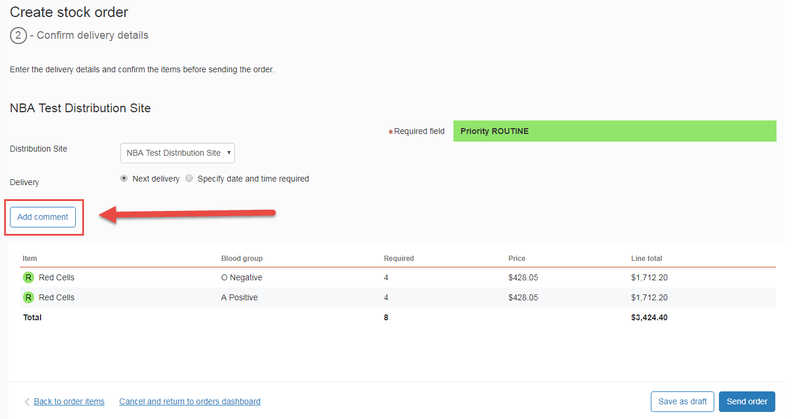 The price displayed in BloodNet for the generic platelet on an order is the same as the apheresis platelet price. However, jurisdictions and in some states approved health providers pay for what is issued to them. For example, if a facility selects generic platelet on an order and the Blood Service issues pooled platelets, the facility or jurisdiction pays the pooled platelet price. The BloodNet User Reference Group (BURG) met on 16 August 2018 via teleconference. The NBA acknowledged the great contribution of the group over several months in the redevelopment of BloodNet. The members were thanked for their involvement in face to face consultations while gathering requirements, input in regular BURG meetings and participation in the user acceptance testing. The NBA advised the group that BloodNet 5 was rolled out with a few reports that were deemed to be critical and that work is continuing to ensure more reports are deployed in the upcoming releases. Members suggested reports they would like prioritised and these will be taken into consideration. The group also provided feedback on outstanding issues and suggested improvements for the system. The NBA has taken this feedback on board and will look into the requests and will update the group in the near future. The group was advised that the main focus for the NBA team is now BloodSTAR Criteria version 3 and NSW on boarding onto BloodSTAR. The NBA values the ongoing involvement of the group in ensuring BloodNet is fit for purpose. The Australian Red Cross Blood Service (Blood Service) has advised that the implementation of the ISBT 128 labelling standard has been delayed. This delay was required to provide additional time for the Blood Service to complete further validation work. The Blood Service has confirmed a revised implementation date of 18 November 2018. 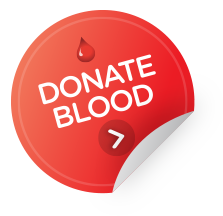 All blood components collected on or after 18 November 2018 will be labelled using the ISBT128 transition label. Further detailed information can be on the Blood Service and NBA websites. Special orders that are likely to be ordered more than once can be added to the ‘Facility favourites’ list. Facility favourites can only be created from special orders that have been sent or dispatched and are not cancelled. The order should also not have already been added to the facility favourites. Locate the order you want to save as a favourite from the ‘Orders’ dashboard or from the ‘all orders’ screen. If the order is still on the ‘active orders’ list, expand the order and click on the ‘Add to facility favourites’ link. Otherwise click on the order number to view the order and then click on the ‘Add to facility favourites’ link available at the top right corner of the screen. The star icon will change colour to yellow to indicate the order is now a facility favourite. Facility favourites can be accessed by clicking on the ‘Facility favourites’ link on the ‘Orders’ dashboard. Please note: Comments entered against a special order will be retained when the order is saved as a facility favourite, so if you have a regular order which requires specific instructions for the Blood Service you will not have to re-enter the comments each time you place the order. The comments function in BloodNet has changed with the release of BloodNet 5. Previously, users were able to enter free text in the comments field. As a result the Blood Service received a wide variety of comments, many of which were not applicable. The new comments section provides users with a list of the most common comments sent from BloodNet and also the option to add free text comments. Click on the ‘Add comment’ button on the ‘Confirm delivery details’ page. A pop up window will appear displaying the various comment options. Click on the relevant option, Red Cells <5 days for example. You can also add free text comments to a predefined comment. For example, you may require Red Cells that are less than 5 days old for O neg only for example. After selecting your comment type click on the text box to the right of the window to enter your additional comments. If the predefined list of comments does not suit your needs you can scroll to the bottom of the ‘Add comment’ window and select the ‘Other’ option and add a custom comment. Once you are happy with your comment click the ‘Save’ button. Further information on BloodNet is available online at https://www.blood.gov.au/bloodnet or by contacting the NBA on 13 000 BLOOD (13 000 25663) or support@blood.gov.au.